WASHINGTON-- The Affordable Care Act was designed to slash the percentage of Americans who lack health insurance, and it's working. The uninsured rate fell to 11.9 percent during the first quarter of this year, 1 percentage point below the rate at the close of 2014, according to the findings of a Gallup-Healthways Well-Being Index poll published Monday. The decline coincides with the start of benefits for new Obamacare enrollees at the beginning of 2015. 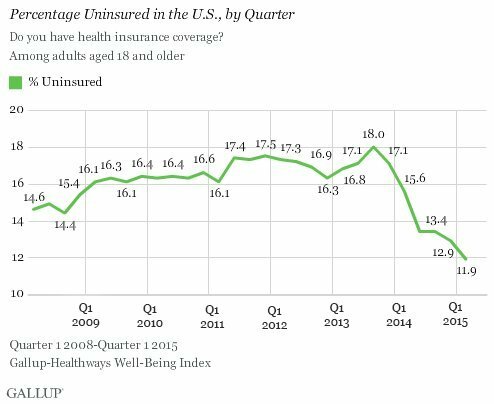 The latest uninsured figure from the Gallup survey is the lowest since the polling firm began tracking the number in 2008, and contributes to a remarkable decline of 5.2 percentage points in the share of people without health coverage since the end of 2013, just before the first wave of Obamacare health insurance enrollees joined the ranks of the insured. African-Americans, Hispanics and people with low incomes saw the greatest gains in insurance coverage, Gallup found. Some of the increase in the proportion of Americans with health coverage likely is related to the improving job market, and the health benefits provided by employers, Gallup notes. But the pollsters conclude that Obamacare is mostly responsible for the current trend because the uninsured rate is lower than it was in early 2008, when the economy was in recession. About 12 million people are covered by private health insurance obtained via the exchanges, according to the Department of Health and Human Services. A separate analysis published by the department last month estimates that 16 million fewer Americans are uninsured because of the Obamacare coverage expansion, including the exchanges and Medicaid. Were more states to expand Medicaid under Obamacare, the uninsured rate would fall more sharply, as it did in Indiana earlier this year. Previous surveys showing state-by-state numbers illustrate that Obamacare's effect on the uninsured is diminished by states' refusal to expand Medicaid. Although Montana appears poised to adopt the Medicaid expansion this month, efforts in states such as Alaska, Missouri, Tennessee and Utah this year have been stymied by Republican opposition. Almost 5.5 million people had enrolled into Medicaid because they qualified under the expansion in 28 states and the District of Columbia, the Department of Health and Human Services reported Friday. The sharp reduction in the uninsured rate since Obamacare benefits began to take effect last year could soon be undone, however. The Supreme Court is slated to rule in June ona lawsuit, King v. Burwell, that claims the Affordable Care Act's subsidies can only be provided in 13 states and the District of Columbia, which operate their own health insurance exchange marketplaces, not in the federally run exchanges in the rest of the country. 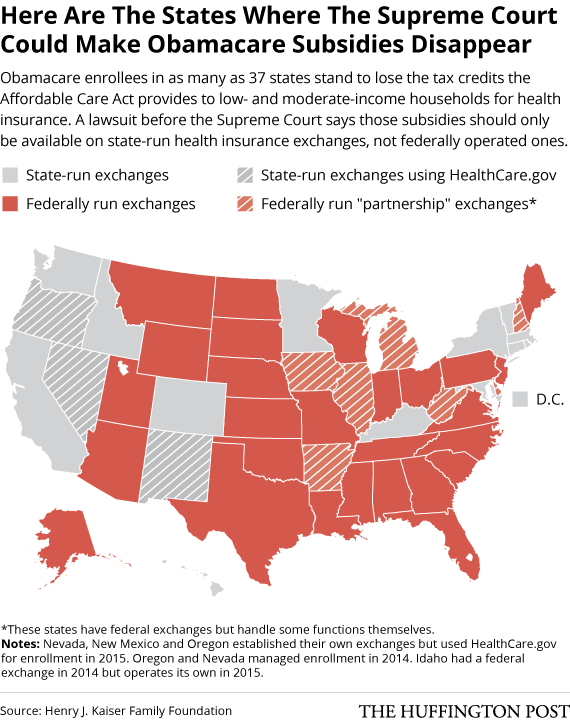 A high court ruling for the plaintiffs would invalidate the subsidies received by more than 85 percent of exchange enrollees and destabilize the insurance markets in states with federal exchanges. The Rand Corp. estimates this would result in 9.6 million people becoming uninsured.